Tha Gilleasbuig gun bhruidhinn airson treiseag. Thèid tòiseachadh as ùr air càineadh is mi-mhòdh cho luath sa ghabhas. 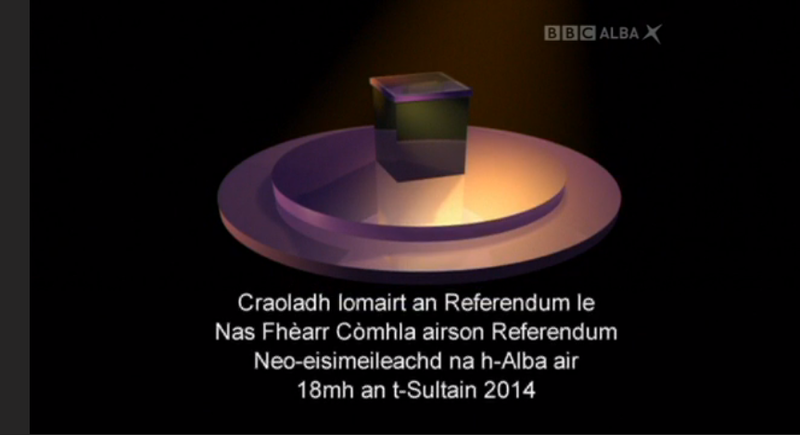 Bha Gilleasbuig air a dhol na thosd airson a' referendum, ach an uair sin - nochd seo air BBC Alba an-raoir, le fò-thiotalan sàr-mhath air an cur ris a' Bheurla. Am bu chòir Alba bhith na dùthaich neo-eisimeileach? Dhomhsa is do mòran eile, chan ann mu dhèidhinn nàiseantachas a tha freagairt na cèist. ’S ann mu dhèidhinn dè seòrsa comann-sòisealta bu mhiann leinn a tha e, agus ciamar a ruigeas sinn ann? Coimhead an Alba sa bheil sinn beò, dùthaich a tha cur thairis le iomadachd is misneachd. Am measg nan iomadach sgeulachd a tha rin cluinntinn tha an sgeul bheag agam fhìn, gall chun na smior ach fear a ghràdhaicheas Gàidhlig is a’ Ghàidhealtachd. Nuair a rugadh is thogadh mise ann an Ceann a Deas Alba, bha e soilleir gu leòr gun robh an Rìoghachd Aonaichte a’ riochdachadh adhartas agus an àm ri teachd, fhad’s a bha neo-eisimeileachd airson Alba a’ coimhead sean-fhasanta agus na cheum air ais. Well a chàirdean, bha moladh mòr aig a h-uile duine air BBC Alba an t-seachdain-sa. Chaidh an làrach-lìn math sa chur air dòigh gus na th'ann dhen a' Bheurla air Banalba a shònrachadh, agus am milleadh a tha sin a' dèanamh. An uair sin chaidh na leanas fhoillseachadh ann an colbh Aonghas Phàdraig Chaimbeul sa Phàipear Bheag. The programme for award-winning satirical Gaelic blogger Gilleasbuig Aotrom's autumn programme is soon to be announced.